Big plans for the day? I’m just going do my normal Sunday routine which is, want to exercise, but don’t, watch Hungry Girl at 10 even though she is annoying & geeky, bake, cook and prep for the week. Of course snacks for the Super Bowl and I’ll relax during the half time show, this year I heard it’s Madonna. Should be interesting. Are you watching the big game? Any parties? Saturday we celebrated Jenny’s birthday, even though it really isn’t until Tuesday. We started off the morning with these. Then we got pedicures, went to lunch at this wonderful bakery that has the best breads, desserts, soups and salads. I was a good girl and had a fruit salad with grilled chicken. They serve it with a side of the most soft raisin cinnamon bread. It’s so good! I haven’t tried making cinnamon raisin bread, but I may change that tomorrow! I always forget how much I love that bread until I have it! Then I came home and made special cupcakes, recipe will come later this week, and then we went to dinner to a Hibachi Grill. I over did it, and over did it big time. But I was good I only ate a couple bites of my fried rice. They didn’t have brown rice, stinky, but they said it’s always requested so there getting it in, in a couple of weeks. I also had hibachi vegetable, shrimp and chicken. I want a Hibachi Grill in my kitchen, how fun would that be? Oh Husband, you know what on want for Valentine’s day? A kitchen makeover with a built-in Hibachi Grill. Ok, I’m dreaming on that one! I bet your wondering about these pancakes. 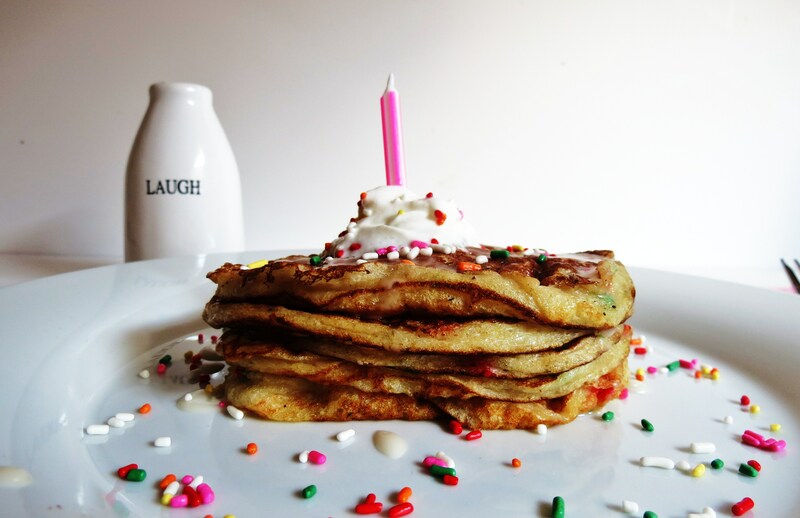 These were a fun SWEET birthday pancake. I’m not kidding their sweet, yet pretty low-calorie, shocking I know! There is no need for syrup with them. They really do taste like cake. 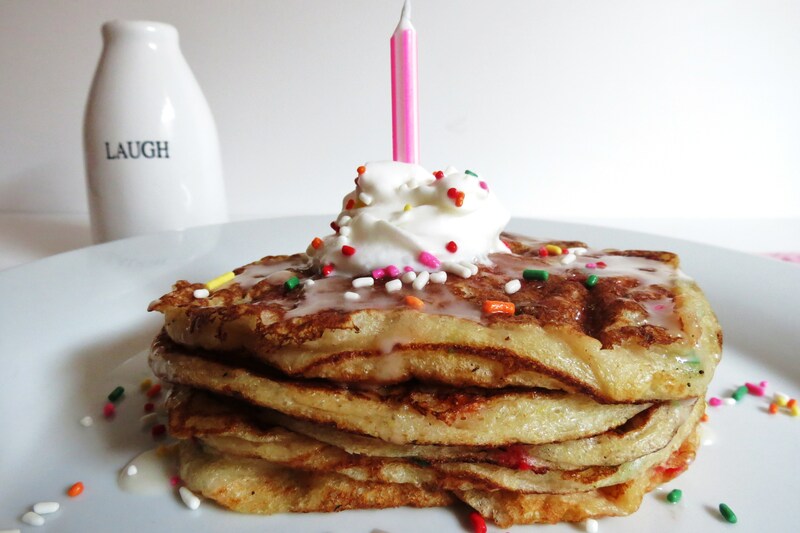 I made them with Funfetti Cake Mix and my traditional yogurt pancakes. I only used a 1/4 cup of cake mix and I can’t believe how much they really taste like cake, I’m still shocked. 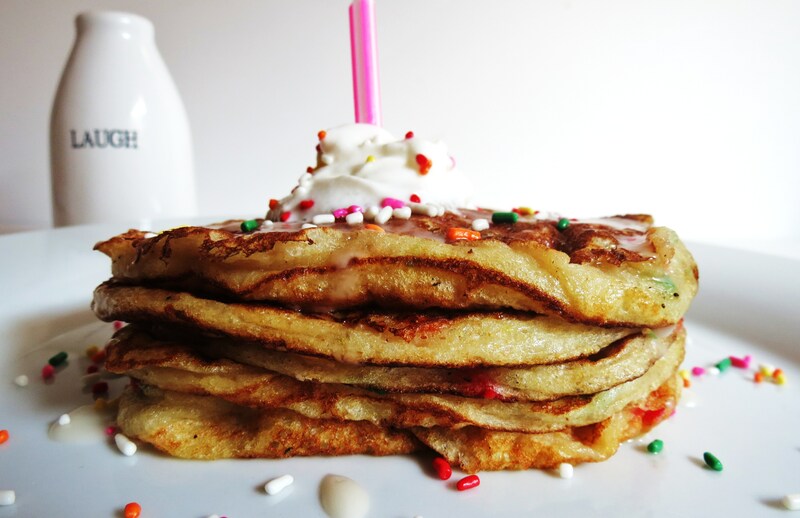 If you like sweet treats in the morning then these pancakes are for you. I got 10 pancakes out of the whole batch! That’s five pancakes each and guess what? Only 220 calories for FIVE of them. Unbelievable! I have a feeling these will be a birthday tradition around here. I wonder if someone would make them for my birthday? Spray your skillet with cooking spray. I do this between every batch. Place 1/4-cup batter onto non-stick skillet, add some sprinkles on top of the batter and cook till bubbles start appearing through the top of the pancake and then flip. NOTE: Cook on medium heat and I flattened out my batter with the spatula to cook more evenly. Make glaze add powdered sugar, vanilla extract and water and mix until a slightly drippy consistency. NOTE: You do not need a lot of the glaze. 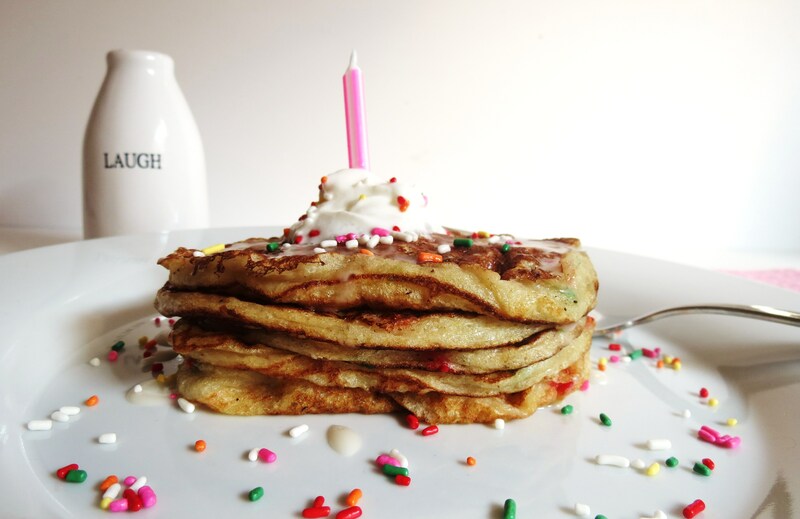 Evenly pour glaze over top of pancakes, add more sprinkles, whip cream and a candle! Happy Birthday! I’m so excited to share with you the fun birthday cupcakes, but that will have to wait, I am so proud of them!! 🙂 I’m also really proud of these pancakes. They are so tasty, light and fluffy with the taste of cake! Mmmmmm cake! I am totally making these again!! I want to make them now and I am so full!! I swear there isn’t enough days to make all the wonderful goodies I see from you and all the goodies I think of. I swear if I keep up on blogging I am going to be as big as a house, but you know what? I’m having fun! First time in a long time that I know I am eating reasonably healthy and I can splurge once in a while. I am just having so much fun creating. I think I finally found something that I like to do and I love sharing it with you!! I am also tickled pink to say that Saturday was my biggest view day yet, I am so proud and so happy!! Thank you so much for stopping by my blog, leaving nice comments and being an inspiration. I wouldn’t be doing this if it wasn’t for you! Wow, I am mushy tonight! 🙂 So I just want to say THANK YOU!!!!! Have a wonderful Sunday, enjoy the Super Bowl and if you’re not into it, make some fun appetizers anyway and relax enjoy your day!! See you tomorrow!!! Yummy! I will definitely be trying these soon! My family loves pancakes! Congrats on your blog doing well! Thanks Erin! Try the pancakes, there so good and so easy, I love that!!! My birthday is in a few weeks and I fully intend on overdoing it. Big time. 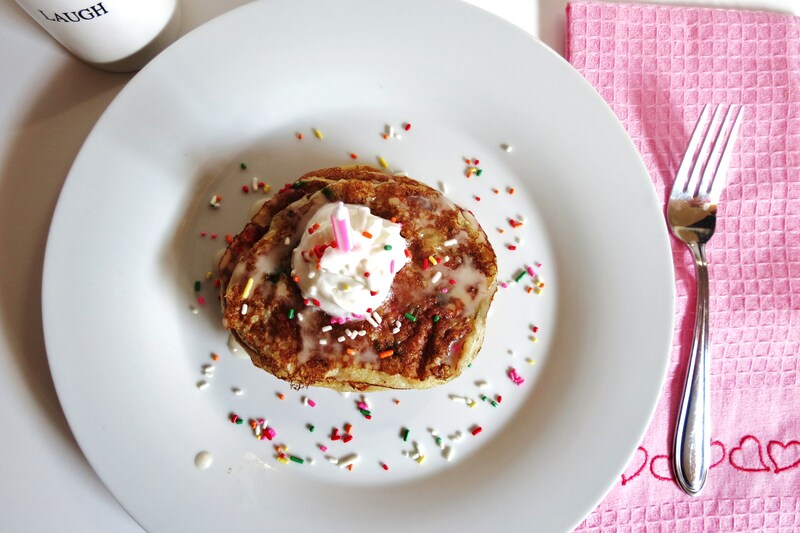 These pancakes seem like the perfect way to start the day! And I love even more that I could eat them on a normal day and not feel totally guilty about it. 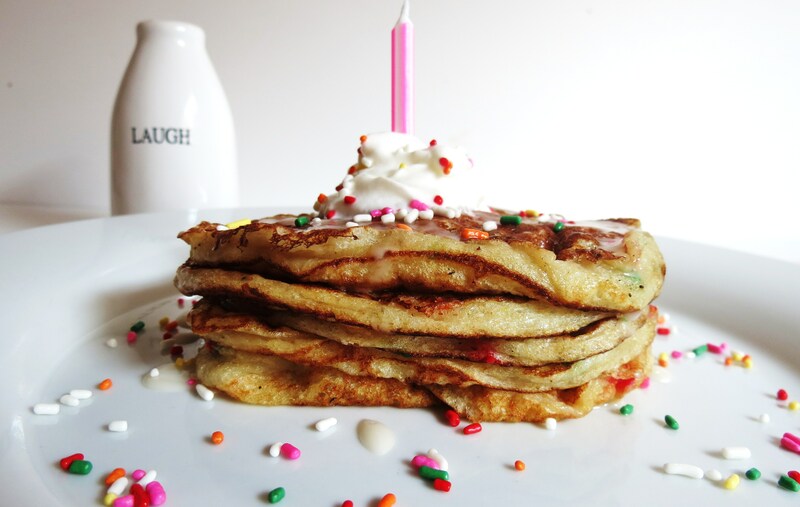 Cake mix pancakes with yogurt in them? Love! 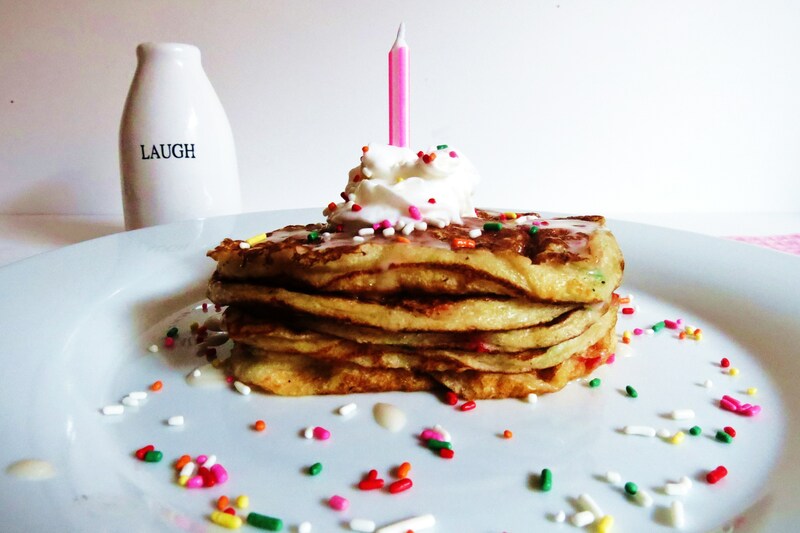 Ooo, I made Funfetti pancakes last year but I would love to do it again with Greek yogurt in the mix! Good call!! 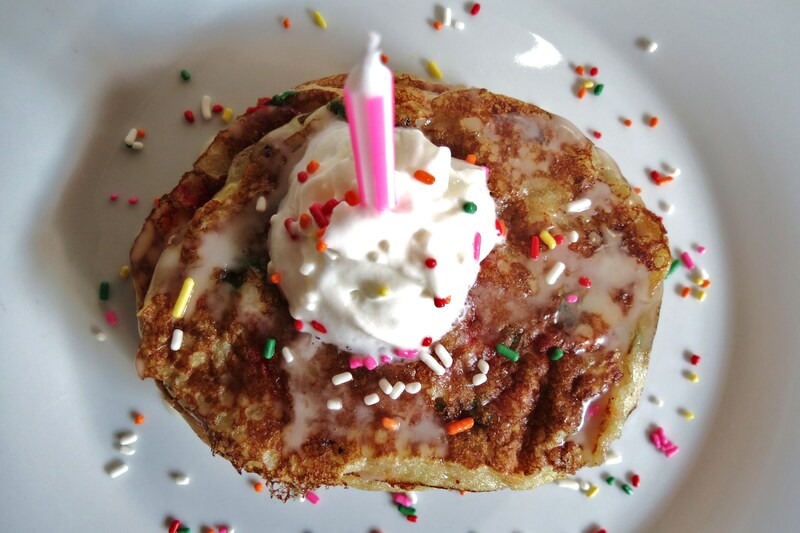 Funfetti pancakes are so good and there cute! I’m a sucker for anything with sprinkles. Thanks Johanna! I linked up and signed for your e-mail!! I look forward to seeing what other people post! !